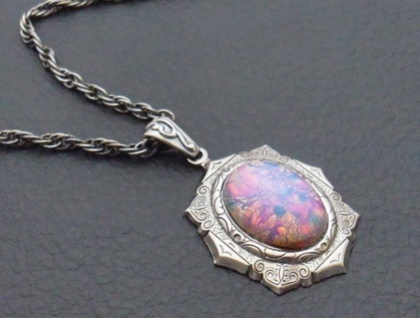 The vintage cabochon or 'jewel' on this pendant is made of glass and foil, to resemble some kind of fabulous opal. 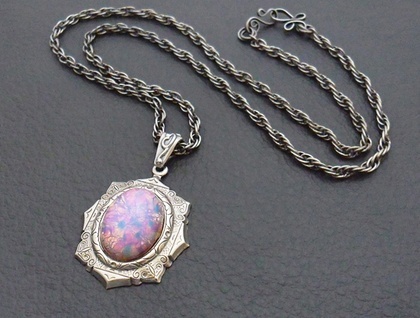 It is slightly milky, with shimmering colours of pink, blue, mauve, amber, and yellow, and is mounted in a highly detailed, pewter plated setting. The components are all of high quality: a sterling silver baile suspends the pendant from a brass based, silver plated, rope-style chain. The necklace fastens with a scrolling, silver-plated hook and eye clasp. The baile, chain and clasp have all been 'antiqued' – artificially aged – to give this necklace a vintage look. The necklace measures 49.2cm, including both parts of the clasp. The setting measures 43mm from top to bottom, including the sterling baile (hanging loop), and 26mm across at its widest point. The 'opal' itself is 18mm tall and 13mm across. 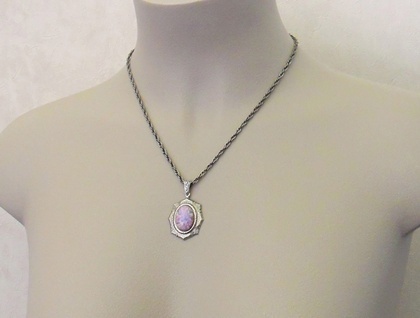 The setting is hollow backed, so the pendant is not as heavy as it may look. 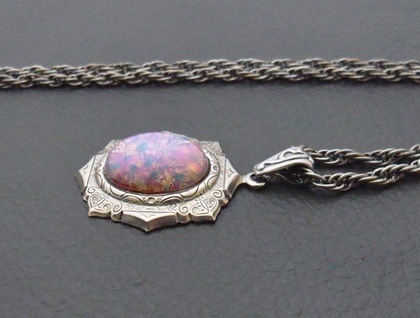 'Dragon Opal' is a one-off design, never to be repeated. Unlike most Silverlight Jewellery pieces, this necklace cannot be altered in length.